What is the nearest major galaxy to our own Milky Way Galaxy? Andromeda. In fact, our Galaxy is thought to look much like Andromeda. 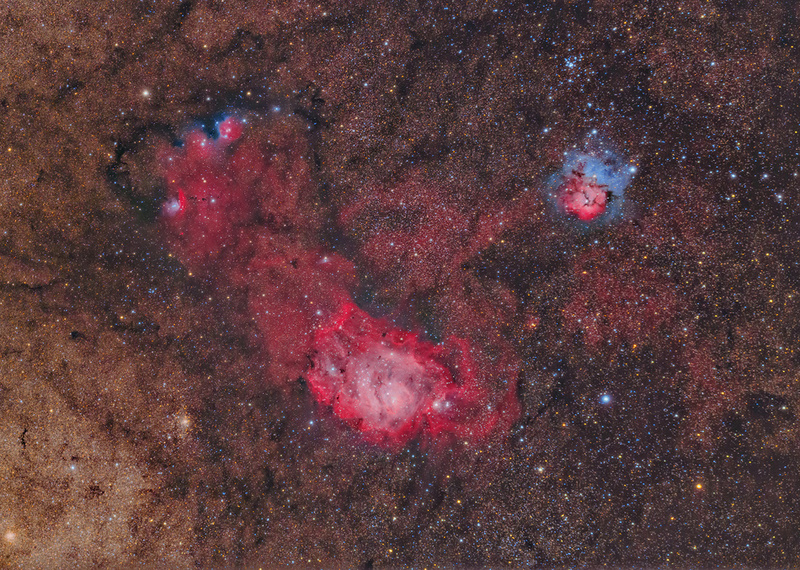 Together these two galaxies dominate the Local Group of galaxies. The diffuse light from Andromeda is caused by the hundreds of billions of stars that compose it. The several distinct stars that surround Andromeda's image are actually stars in our Galaxy that are well in front of the background object. Andromeda is frequently referred to as M31 since it is the 31st object on Messier's list of diffuse sky objects. 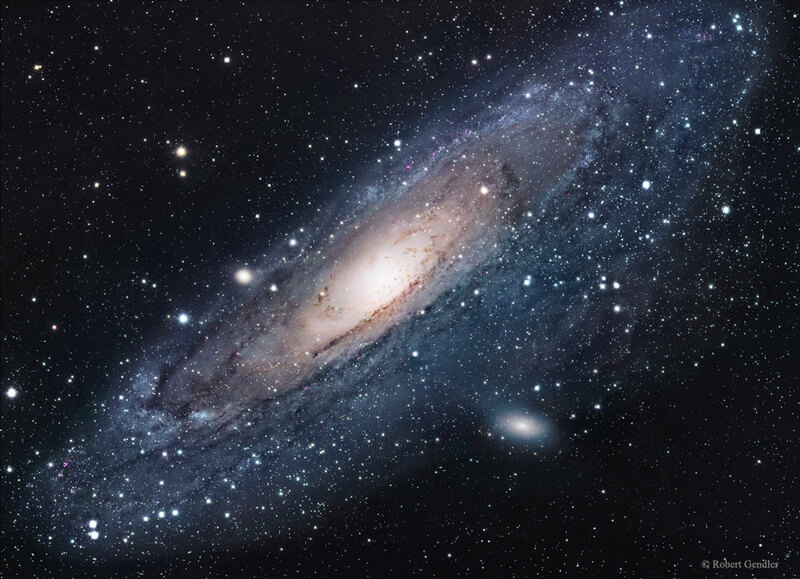 M31 is so distant it takes about two million years for light to reach us from there. Although visible without aid, the above image of M31 is a digital mosaic of 20 frames taken with a small telescope. Much about M31 remains unknown, including exactly how long it will before it collides with our home galaxy. This cosmic snapshot composed with image data from NASA's Wide-field Infrared Survey Explorer (WISE) satellite captures a multitude of faint stars and distant galaxies toward the constellation Lyra at wavelengths longer than visible light. But the object circled at the center is not quite a star. 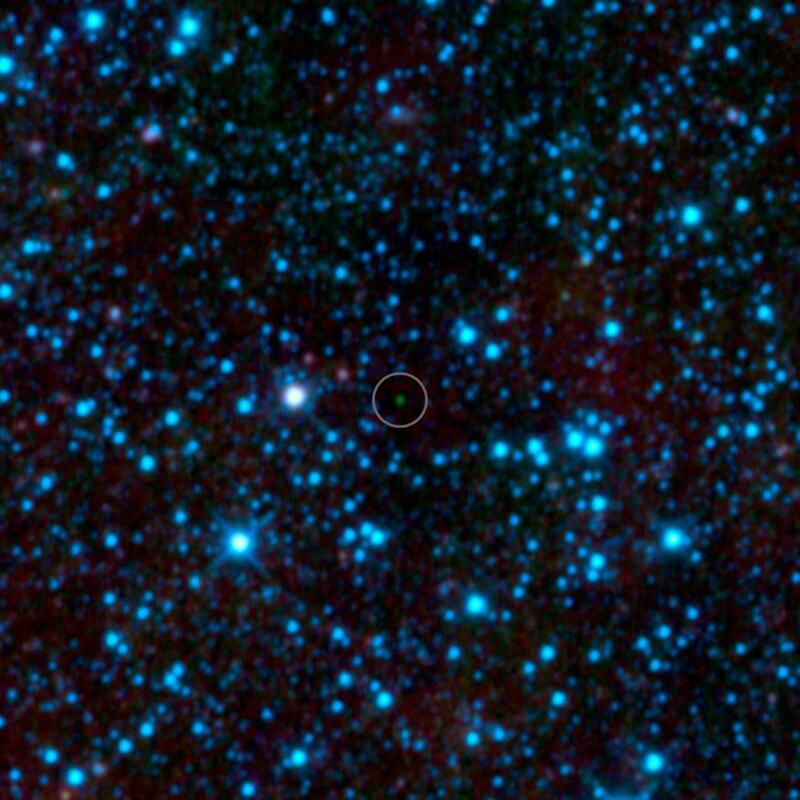 Cataloged as WISE 1828+2650, it lies within 40 light-years of the Sun and is currently the coldest brown dwarf known. A brown dwarf begins like a star, with the gravitational collapse of a dense cloud of gas and dust, but is not massive enough to achieve the core temperatures and densities that trigger hydrogen fusion, the stable source of a star's energy. Instead the failed star ultimately cools and emits most of its light at infrared wavelengths. Remarkably, brown dwarfs are roughly the size of the planet Jupiter. How cold is WISE 1828+2650? While brown dwarfs have measured surface temperatures of up to 1,400 degrees C (2,600 degress F), this brown dwarf , assigned to spectral class Y, has the estimated temperature of a warm room, less than about 27 degrees C (80 degrees F). Could life once have survived on Mars? Today, neither animal nor plant life from Earth could survive for very long on Mars because at least one key ingredient -- liquid water -- is essentially absent on the red planet's rusty surface. 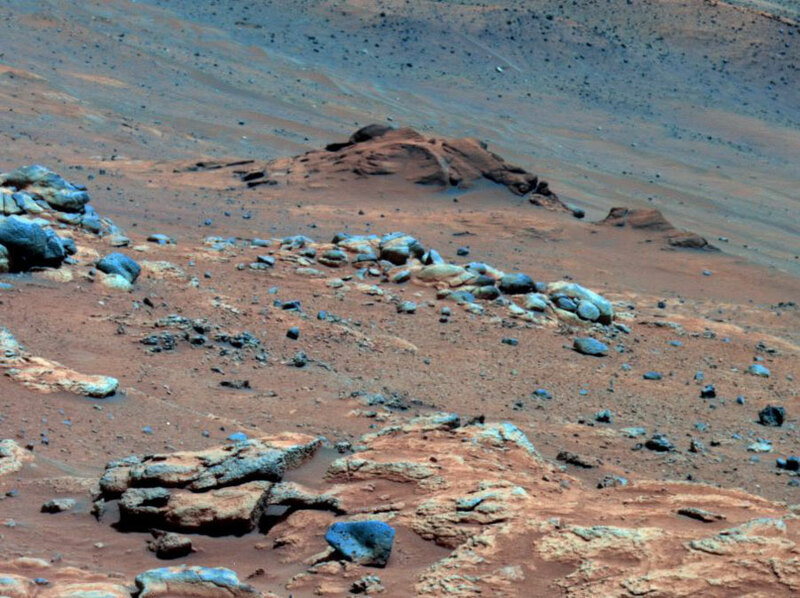 Although evidence from the martian rovers indicates that long ago Mars might once have had liquid water on its surface, that water might also have been too acidic for familiar life forms to thrive. Recently, however, a newly detailed analysis of an unusual outcropping of rock and soil chanced upon in 2005 by the robotic Spirit rover has uncovered a clue indicating that not all of Mars was always so acidic. 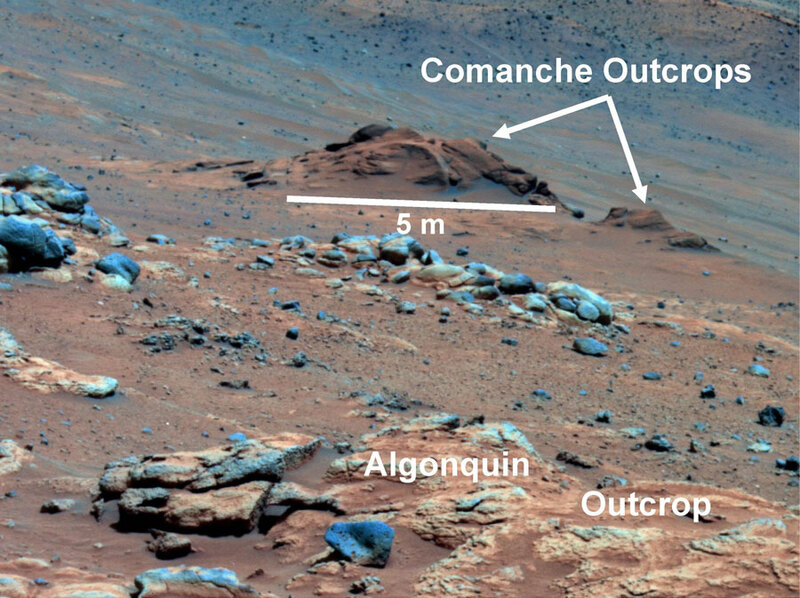 The mound in question, dubbed Comanche Outcrop and visible near the top of the above image, appears to contain unusually high concentrations of elements such as magnesium iron carbonate. The above image is shown in colors exaggerated to highlight the differences in composition. Since these carbonates dissolve in acid, the persistence of these mounds indicates that water perhaps less acidic and more favorable for life might have once flowed across Mars. More detailed analyses and searches for other signs will surely continue. These bacteria could survive on another planet. In an Earth lab, Deinococcus radiodurans (D. rad) survive extreme levels of radiation, extreme temperatures, dehydration, and exposure to genotoxic chemicals. Amazingly, they even have the ability to repair their own DNA, usually within 48 hours. Known as an extremophile, bacteria such as D. rad are of interest to NASA partly because they might be adaptable to help human astronauts survive on other worlds. A recent map of D. rad's DNA might allow biologists to augment their survival skills with the ability to produce medicine, clean water, and oxygen. Already they have been genetically engineered to help clean up spills of toxic mercury. Likely one of the oldest surviving life forms, D. rad was discovered by accident in the 1950s when scientists investigating food preservation techniques could not easily kill it. 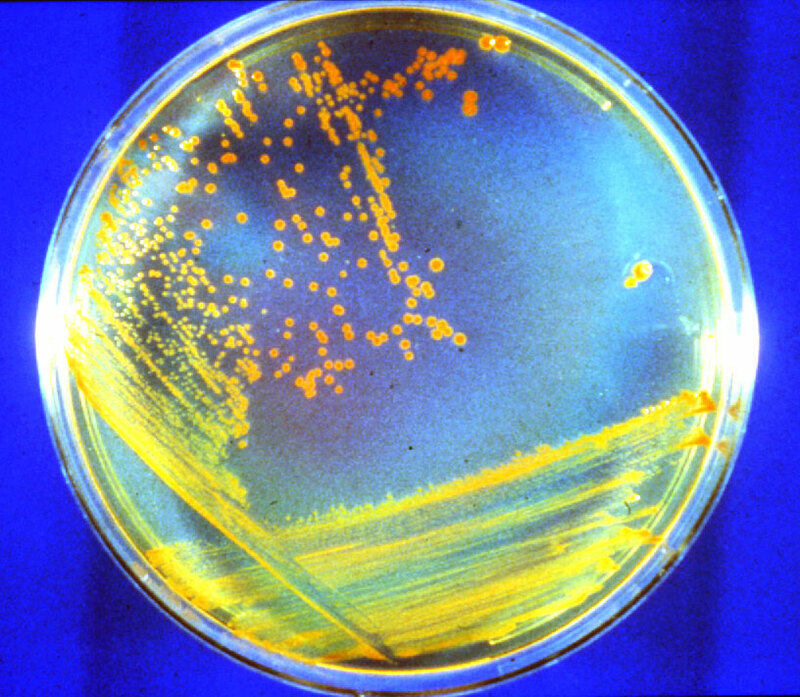 Pictured above, Deinococcus radiodurans grow quietly in a dish. Why is sunspot 905 backwards? Perhaps it is a key marker for the beginning of a new magnetic cycle on our Sun. Every 11 years, our Sun goes through a magnetic cycle, at the end of which its overall magnetic orientation is reversed. An 11-year solar cycle has been observed for hundreds of years by noting peaks and valleys in the average number of sunspots. Just now, the Sun is near Solar Minimum, and likely to start a long progression toward the most active time, called Solar Maximum, in about 5.5 years. An indicator that the sun's magnetic field is reversing is the appearance of sunspots with the reverse magnetic polarity than normal. A few weeks ago, one small candidate reverse sunspot was sighted but faded quickly. 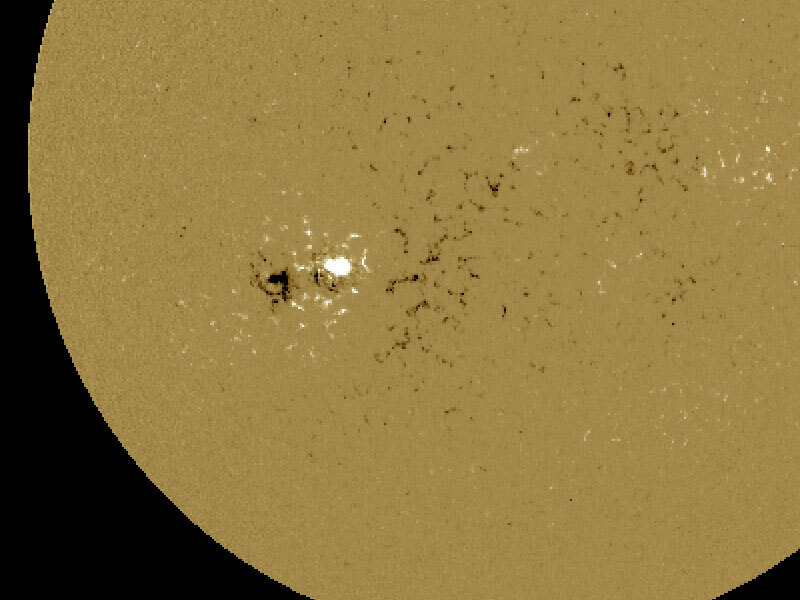 Now, however, a larger sunspot with negative polarity is being tracked. This sunspot, numbered 905, appears as the unusual white spot in the above magnetic image of the Sun taken with the SOHO spacecraft a few days ago. In the past few days, Sunspot 905 has actually begun to break apart and might also become the source of coronal mass ejections and explosive solar flares. Solar astronomers predict that the coming Solar Maximum will be unusually active. 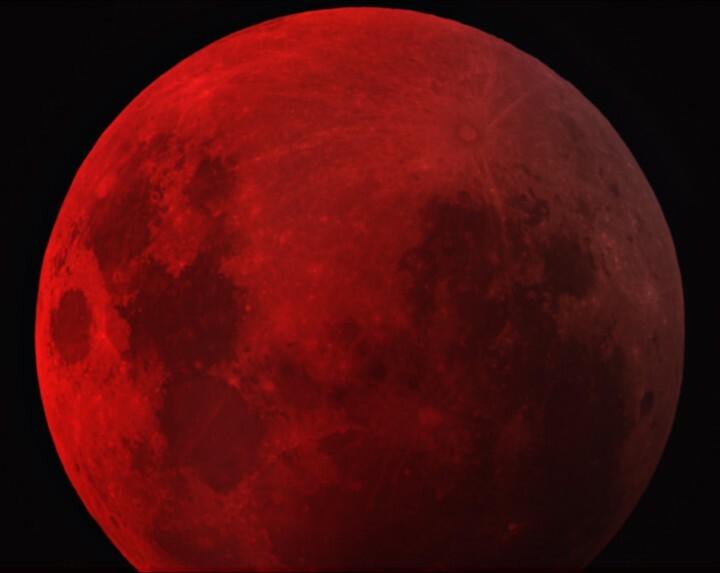 Sometimes, even a small telescope can help unlock a hidden beauty of the heavens. Such is the case of the bright double star Albireo. Seen at even slight magnification, Albireo unfolds from a bright single point into a beautiful double star of strikingly different colors. At 380 light years distant, the two bright stars of Albireo are comparatively far from each other and take about 75,000 years to complete a single orbit. The brighter yellow star is itself a binary star system, but too close together to be resolved even with a telescope. 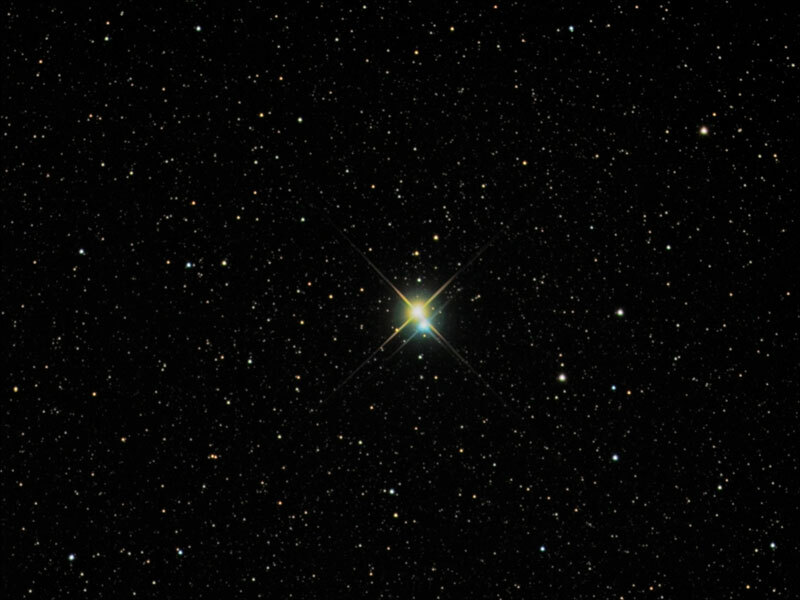 Albireo, pictured above, is the fifth brightest star system toward the constellation of the Swan (Cygnus) and easily visible to the unaided eye. 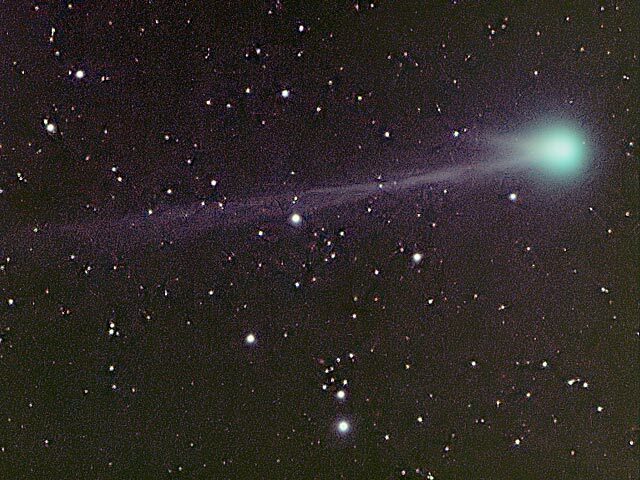 A comet discovered last year has brightened unexpectedly and now may become visible to the unaided eye within the next month. Designated Comet C/2003 K4 (LINEAR), the comet was discovered in 2003 May by project LINEAR. Many reports already place the comet as brighter than magnitude 7, meaning that it can now be seen with binoculars. Reports also indicate the comet already has a visible tail nearly the length of a full Moon. Since predicting the future brightness of comets is a very tricky business, there remains the possibility that K4 might never become very bright. Current predictions, however, estimate the comet may approach fifth magnitude in October. K4 passes closest to the Sun on October 12 and then closest to the Earth on December 23. Comet K4 was photographed above from Van Buren, Arkansas, USA on August 17. For billions of years, massive stars in our Milky Way Galaxy have lived spectacular lives. Collapsing from vast cosmic clouds, their nuclear furnaces ignite and create heavy elements in their cores. After a few million years, the enriched material is blasted back into interstellar space where star formation begins anew. The expanding debris cloud known as Cassiopeia A is an example of this final phase of the stellar life cycle. 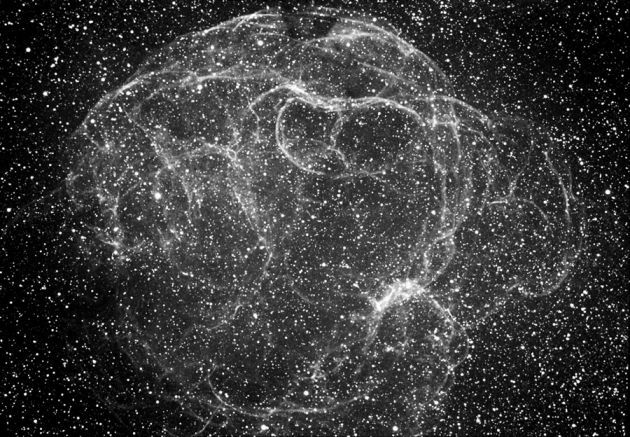 Light from the explosion which created this supernova remnant was probably first seen in planet Earth's sky just over 300 years ago, although it took that light more than 10,000 years to reach us. In this gorgeous Hubble Space Telescope image of cooling filaments and knots in the Cas A remnant, light from specific elements has been color coded to help astronomers understand the recycling of our galaxy's star stuff. 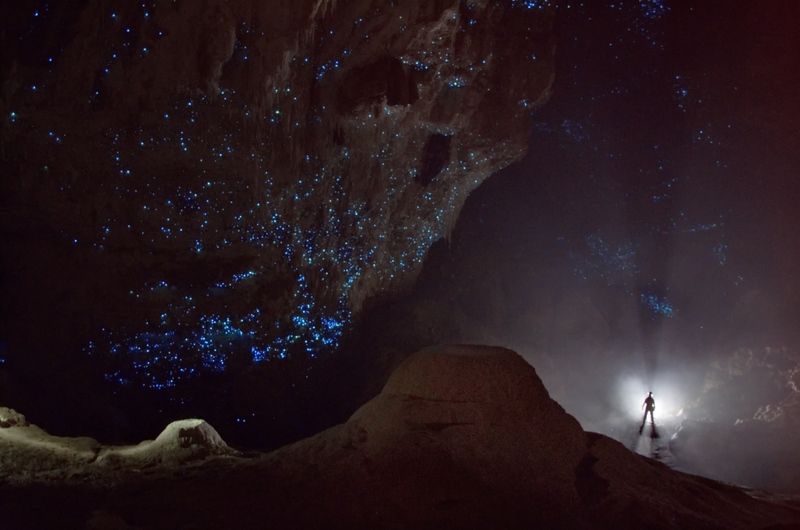 For instance, red regions are dominated by emission from sulfur atoms while blue shades correspond to oxygen. The area shown is about 10 light-years across. It's easy to get lost following the intricate filaments in this stunningly detailed image of faint supernova remnant Simeis 147. Seen towards the constellation Taurus it covers nearly 3 degrees (6 full moons) on the sky corresponding to a width of 150 light-years at the stellar debris cloud's estimated distance of 3,000 light-years. On three separate nights in December 2001 and January 2002 astronomer Steve Mandel accumulated a total of over eight hours of exposure time to compose this image. 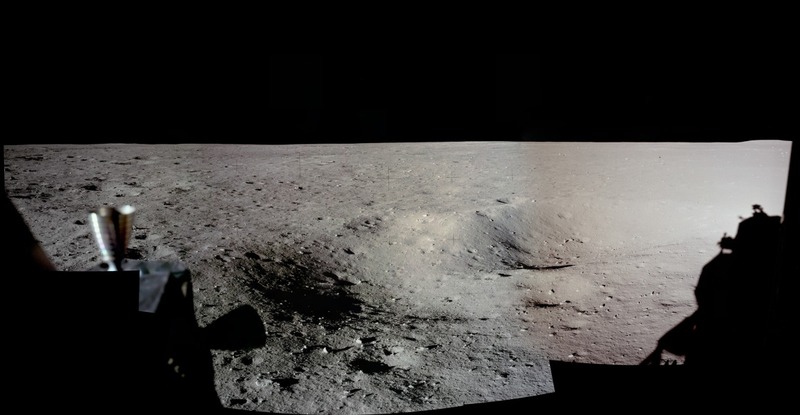 He used an astronomical CCD camera, telephoto lens, and his specially designed adapter to allow such wide-field digital imaging. 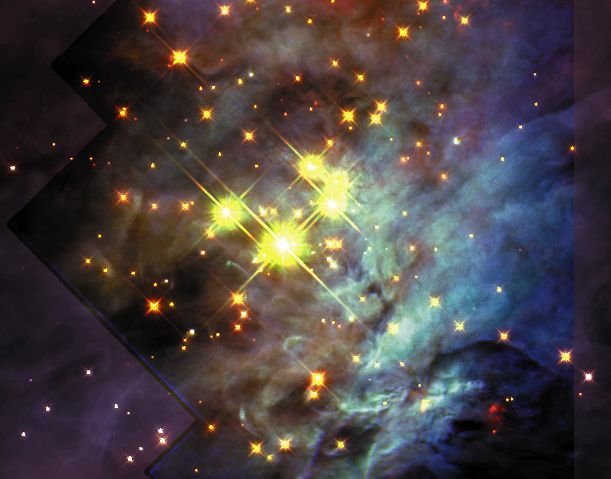 He also used a narrow H-alpha filter to transmit only the the light from recombining hydrogen atoms in the expanding nebulosity, defining the regions of shocked, glowing gas. 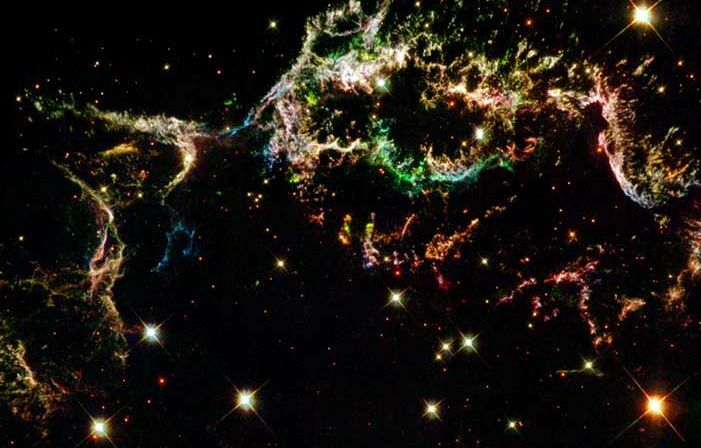 This supernova remnant has an apparent age of about 100,000 years (light from the original explosion first reached Earth 100,000 years ago) but it is not the only aftermath of the massive stellar explosion. The cosmic catastrophe also left behind a spinning neutron star or pulsar, all that remains of the star's dense core. How Big Is 2001 KX76? Credit: ESA, ESO, Astrovirtel, Gerhard Hahn (German Aerospace Center, DLR), et al. Newly discovered minor planet 2001 KX76 is circled in the top panel above, a recent composite image from the European Southern Observatory's 2.2 meter telescope at La Silla, Chile. Though 2001 KX76 appears here as single point of light in an unremarkable star field, its orbit has been accurately measured by Astrovirtel, a newly operational "virtual telescope" capable of mining many years of archival data for previously unrecognized images of 2001 KX76. The results show this minor planet to be very distant, now orbiting just beyond Pluto and Charon in the realm of the Kuiper Belt. At its distance, apparent brightness, and assuming a reasonable surface reflectivity, 2001 KX76 would be 1,200 kilometers or more across -- larger than the largest main-belt asteroid, Ceres. In fact, the illustration in the bottom panel graphically compares this size estimate to Pluto, Charon, and the largest previously known Kuiper Belt objects, indicating the newfound minor planet is second only to Pluto in diameter. 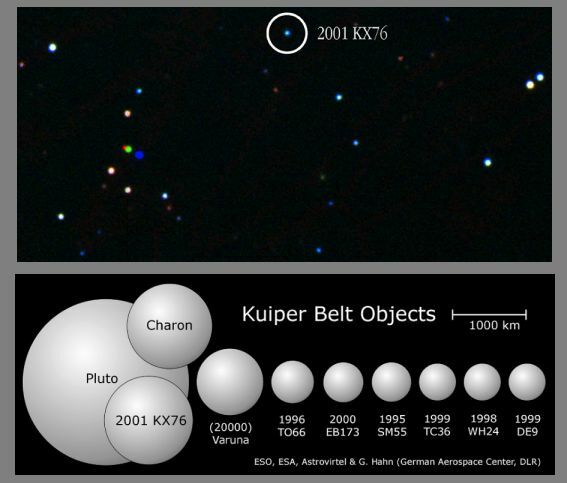 Along with other evidence, the comparison suggests that Pluto and Charon are closely related to Kuiper Belt worlds like 2001 KX76. Here is what the Earth looks like during a solar eclipse. The shadow of the Moon can be seen darkening part of Earth. This shadow moves across the Earth at nearly 2000 kilometers per hour. Only observers near the center of the dark circle see a total solar eclipse - others see a partial eclipse where only part of the Sun appears blocked by the Moon. 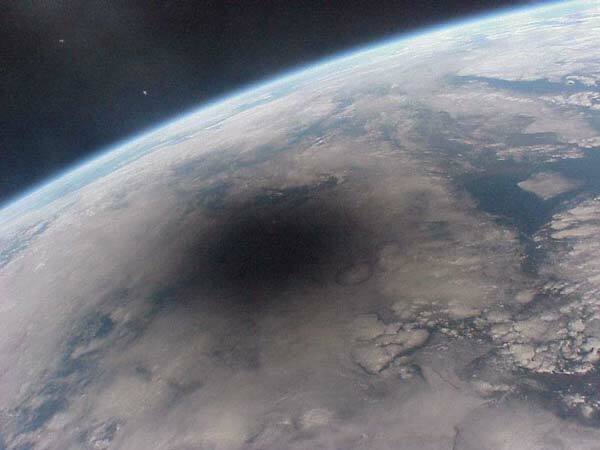 This spectacular picture of the 1999 August 11 solar eclipse was one of the last ever taken from the Mir space station, as Mir is being decommissioned after more than ten years of productive use. This is what the United States of America looks like at night! Can you find your favorite US city on this image? Surprisingly, city lights make this task quite possible. The above picture is actually a composite of over 200 images made by satellites orbiting the Earth. Scans were made by the USAF Defense Meteorological Satellite Program (DMSP) Operational Linescan System. The DMSP satellites continue to help in the understanding and prediction of weather phenomena as well as provide key information about population patterns, city light levels, and even rural forest fires. Galileo Galilei made a good discovery great. Upon hearing at age 40 that a Dutch optician had invented a glass that made distant objects appear larger, Galileo crafted his own telescope and turned it toward the sky. Galileo quickly discovered that our Moon had craters, that Jupiter had it's own moons, that the Sun has spots, and that Venus has phases like our Moon. Galileo, who lived from 1564 to 1642, made many more discoveries. Galileo claimed that his observations only made sense if all the planets revolved around the Sun, as championed by Aristarchus and Copernicus, not the Earth, as was commonly believed then. The powerful Inquisition made Galileo publicly recant this conclusion, but today we know he was correct. Skylab was an orbiting laboratory launched by a Saturn V rocket in May 1973. Skylab was visited three times by NASA astronauts who sometimes stayed as long as two and a half months. Many scientific tests were preformed on Skylab, including astronomical observations in ultraviolet and X-ray light. Some of these observations yielded valuable information about Comet Kohoutek, our Sun and about the mysterious X-ray background - radiation that comes from all over the sky. Skylab fell back to earth on 11 July 1979.